I have decided to explore longer exposures in my street photography as it creates some interesting effects , along with the obvious movement emphasis , at 1/8 and 1/15 of a second you can still get very sharp images with practice and a steady hand by composing your focus on an interesting stationary subject . I find you can get very cubisty ( my new word ) and delve deeper into the reality of your subject by revealing your context in a more abstract manner . When i went out today on one my addiction satisfying street photography jaunts , my mind was concerned with the power of the internet the benefits and burdens it brings us . The internet is very efficient distraction device . 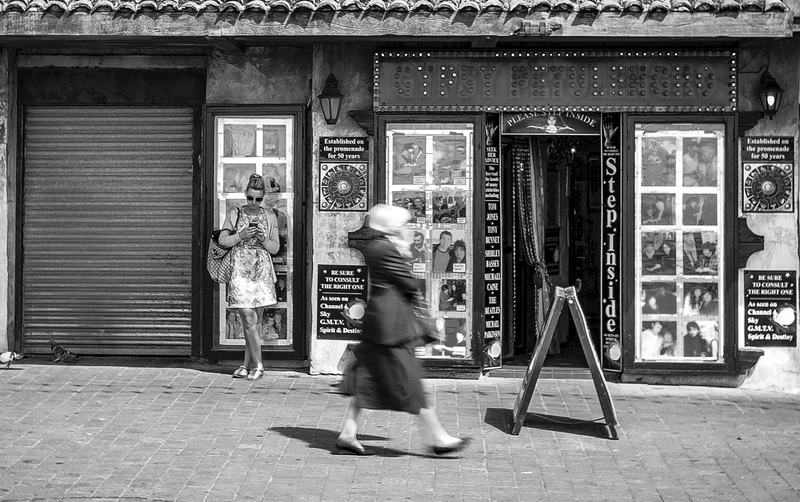 In this shot you can see a content women , stood outside a fortune tellers , whose attention is fixed on her mobile phone , oblivious to the passer by . Most people step inside these dissembled virtual worlds by means of there own minds through want of Knowledge or an altered reality , and a lack of knowledge or understanding of its true vocation keeps them there . A sort of escapism . The internet is like a technologically advanced fortune teller , where it gives you what you want when you want it , at a price …. But ..it is all lies or exaggeration to make you feel special , or trick you into believing in this reality that is individually created for you . We like to think we have freedom of choice … well do we ?